Stephen Kovacevich is one of the most revered musicians of his generation. He has won unsurpassed admiration for his interpretation of Beethoven, Brahms, Mozart and Schubert. A Grammy nominated artist, Kovacevich has a long list of recordings for Philips and EMI. Most recently he has released, to unanimous critical praise, Beethoven’s Diabelli Variations for Onyx Classics, forty years after his first recording of the work. Stephen Kovacevich is one of the most searching interpreters, never afraid to take both technical and musical risks in order to achieve maximum expressive impact. As a pianist he has won unsurpassed admiration for his playing, non-more than from Leopold Stokowski who wrote: “You do with your feet what I try to do with my Philadelphia Orchestra”. Born in Los Angeles, Stephen Kovacevich laid the foundation for his career as concert pianist at the age of eleven. After moving to England to study with Dame Myra Hess, Stephen made his European debut at Wigmore Hall in 1961. Since then he has appeared with many of the world’s finest orchestras and conductors including Hans Graf, Bernard Haitink, Kurt Masur, Simon Rattle and Georg Solti. 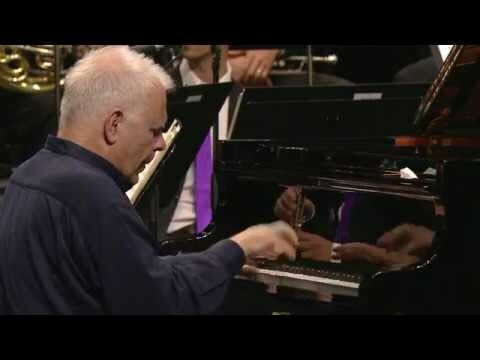 In addition, he has forged many longstanding professional relationships, most notably with Colin Davis with whom he made numerous outstanding recordings, including the legendary Bartok Piano Concerto No.2 with the BBC Symphony Orchestra. Recent and upcoming recital highlights include an extensive tour of the Far East, recitals in Paris, Berlin, Boston, Zagreb, Dublin and Cardiff, alongside two live BBC Radio 3 broadcasts from St George’s Hall, Bristol and Wigmore Hall. His recent concerto highlights include a triumphant return to Montreal Symphony Orchestra (under David Zinman), Yomiuri Nippon Symphony Orchestra (with Sylvain Cambreling), Malaysian Philharmonic (Jacek Kaspszyk), Orchestre de chambre de Paris (John Nelson) and Sydney Symphony Orchestra (Vladimir Ashkenazy). Stephen recently performed to a sell-out audience for his recital at the International Piano Series at the Queen Elisabeth Hall in London. In addition, Stephen is a regular soloist at the Verbier and Lugano festivals. Stephen is a committed chamber musician who has collaborated with Jacqueline du Pré ( with whom he recorded their celebrated recording of Beethoven’s Sonatas No. 3 and 5), Martha Agerich, Steven Isserlis, Nicola Benedetti, Nigel Kennedy, Lynn Harrell, Gautier Capuçon, Renaud Capuçon, Kyung-wha Chung, Truls Mørk, Emmanuel Pahud, Anna Larsson, Alina Ibragimova, Philippe Graffin, Joseph Suk and the Amadeus, Belcea and-Cleveland Quartets. Stephen Kovacevich has enjoyed an illustrious long-term relationship with recording companies Philips and EMI. To celebrate his 75th birthday, Decca has released a Limited Edition 25 CD Box Set of his entire recorded legacy for Philips. In 2008 Stephen Kovacevich recorded Beethoven’s Diabelli Variations exactly 40 years after his first recording of the work. This Onyx recording won him the 2009 Classic FM Gramophone Editor’s Choice Award and the ‘Top Choice’ by Gramophone Magazine in September 2015, to quote: “his seasoned yet fearless mastery reveals something new with each hearing”. […] listening to Kovacevich’s music making is ­experiencing a musician completely absorbed in his craft. Every phrase had shape, purpose and integrity. He draws on a seemingly infinite dynamic palette, particularly at the quiet end of the spectrum. Kovacevich’s interpretations are like no one else’s and always emanate directly from the heart. The audience sat spellbound throughout, drinking in Kovacevich’s musical message of wisdom, peace, resignation and hope. When he opened with the Partita's Prelude [Bach: Partita No 4], a rejuvenation of sorts took place, yielding some of the most lucid and sublime Bach-playing thought possible. The aria-like Allemande and slow Sarabance were beautifully voiced, while the faster dance steps in the Courante and Menuet kicked on with life. This was capped by a most fluent fugal finale in the Gigue where his mercurial fingers never seemed to tire. Stephen Kovacevich gave a masterclass in subtlety by playing the Mozart Piano Concerto No.24 at a volume level that rarely rose above a whisper. The touch was delicate yet clear and firm, every note counted. For Alban Berg’s one-movement Piano Sonata, Kovacevich used the soft pedal and sustaining pedal to create clouds of soft sound. Bach’s Partita No. 4 received the most eccentric performance [...] The Sarabande was the high point of this unusual Bach, with the rising melodic turn that marks the piece not exaggerated but just allowed to pose its question gracefully. Kovacevich, who recorded the complete Beethoven sonata cycle for EMI, was at the height of his narrative powers in Beethoven’s Op. 110. He drew us through the delicate curlicues of figuration in the first movement and into the plucky Scherzo, with its quotations of comic songs. A withdrawn, lonely take on the Klagender Gesang section, more silent scream than opera aria, was then obliterated by the joyful fugue that ends the piece, growing more and more ecstatic. Kovacevich’s account after the interval of a third sparely written work from the end of its composer’s life, Schubert’s B flat Sonata, evinced a contrasting gentleness: the music’s expansive serenity firmly conveyed (the angry outbursts of the finale hardly soft-pedalled) but with an intimacy, even a privacy, verging on the otherworldly. To hear Stephen Kovacevich or Martha Argerich play in recital is a privilege not to be taken lightly. When these two formidable musicians come together, as they did for this 75th birthday concert for Kovacevich, the result can only be a very special event. For the first half, they offered a pair of two-piano works. In Debussy’s En Blanc et Noir, coloured in part by the horrors of war, they did justice to his darker reflections and whirling exuberance. 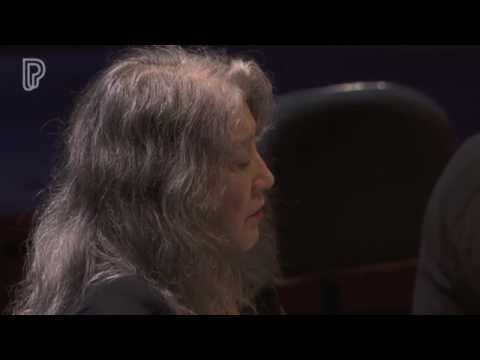 In Rachmaninov’s Symphonic Dances, Kovacevich persuaded Argerich to adopt certain tempi favoured by the composer, including a decidedly measured first movement and a fleet waltz. That, and their fiery intensity and exhilarating virtuosity, produced an altogether exceptional performance. Kovacevich returned to more familiar territory with Schubert’s B flat Piano Sonata, D960. Any slight compromise in technical control is easily offset by the searching quality of his pianism. Perhaps he was distracted by an apparently malfunctioning pedal, but this was a reading of undoubtedly poetic insights and occasional sublimity rather than sustained revelation. By way of an encore, the violinist Alina Ibragimova emerged from the audience to play Rachmaninov’s Vocalise with Kovacevich as a birthday present. The stage management had the not inappropriate ad hoc feel of a birthday party, but what mattered was the performance, of exquisite subtlety and soaring lyricism. [Sonata in E flat D960, Schubert] …….. We are not here dealing with the metaphysics of a Richter, or the inner lyricism of a Kempff, Kovacevich offers us the best of all worlds, equal to the breadth and depth of a tenderness used to calm childhood fears. He clears the first hurdle, the andante sostenuto, without holding back or sentimentality, his only preoccupation being the beauty of the tone and shape of the phrases. A totally masterful interpretation, in which the simplicity of the melody becomes an expressive force. Not a recital, but a lesson. Pianist Stephen Kovacevich joined the orchestra in the first half to perform Beethoven's fourth piano concerto. Kovacevich is a renowned Beethoven interpreter and his account largely focused on the work's intrinsic lyricism. There was nothing brash about Kovacevich's thoughtful, elegant pianism. His refined tone, nuanced dynamics and dextrous sotto voce passagework were impressive. …Kovacevich excelled – At the close, the transcendent finale, a tender minuet, thundered back to earth with one short fortissimo crash. Kovacevich whipped his hands from the keys as if scorched. Stephen Kovacevich is a master to be admired; faithful to the spirit of the music yet always individual, his pianistic artistry reside in his sculpted sound, risk-taking, utmost focus and uniquely attractive, variegated touch. His understanding of Beethoven’s juxtapositions of beauty and crudity, reflection and action, and the sheer dynamic range are fully exposed… Kovacevich brings an easy brilliance to the light tripping Courante and the bold contours of the final Gigue. Nor is he afraid to make Bach his own, drawing the listener in with his sotto voce Allemande, adding ornaments and playing around with rhythms, but all is done with the utmost musicality. Altogether, a disc to treasure. Kovacevich lifted the lid on the music’s subtleties, its spontaneity and diversity of colour… he elucidated the character of each variation, at times with delicacy and lightness but also with power, acuity of rhythm and, above all, with a firm sense that the work, for all its sly diversions, had structure and cohesion, grandeur and inevitability. It had music greater than any one performance can be...This also was a rare encounter with an artist in maturity who recently had surpassed himself in the work that had made his reputation as a youth. So in several ways the recital was unusual, moving, memorable... Control that sounded effortless brought some of the fastest, clearest and most delicate playing. Power was held in reserve. When steam did build up and got discharged, as in later, faster variations and the great broken-off fugue, the effect was of tremendous energy flung, like fireballs by a catapult. Still, the impression overall was of naturalness eventually achieving radiance.